Yesterday was a bit of a downer for me. However, this morning I've been going over what happened yesterday. Why did I let the happenings of yesterday get me down? Everything that happens, gets resolved. This morning, I am back to my old self again! 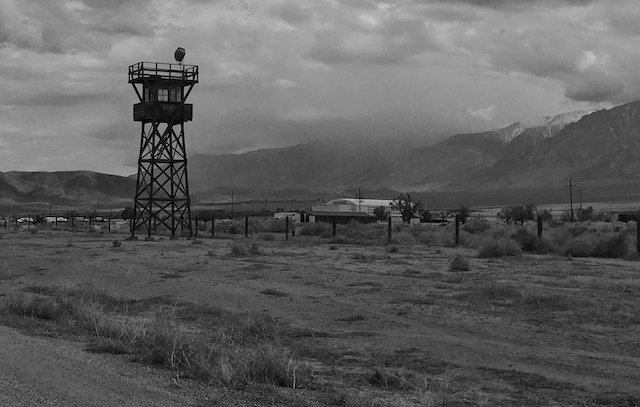 Yesterday we drove thru the area of the concentration camp, Manzanar. About 10,000 Americans of Japanese ancestry were illegally kept here during World War II. There is a Vons Grocery here. The only grocery that carries the matzohs that I love! On the way here, Little iPhone captured some pics. The brown desert has turned green! All during a day's trip, we on the Scampy Team keep our eyes open for our next Nite Camp. We know absolutely, that we shall find our Nite Camp. 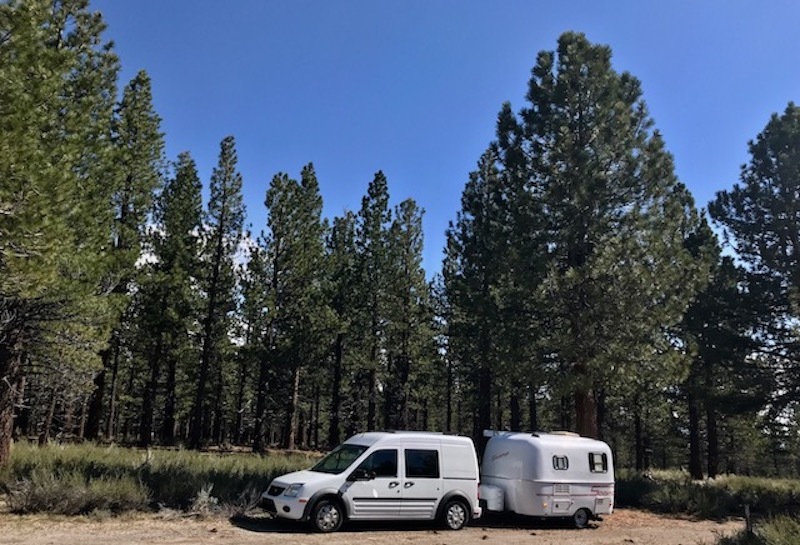 For that reason, we never contemplate the possibility of staying in an RV Campground. The place where we are now is in a Ponderosa Pine forest. Be sure to have a mechanic check out Transito. There shouldn't be a reason that your speed dropped to 5mph regardless of the grade unless the vehicle went into "limp mode". What a beautiful sight it must be to wake up to snow capped mountains towering into the sky....to make you be yourself again. Roll with the punches they say. In my older years, I too fall a lot but no biggy. I get up dust myself off and keep on going. I know myself well enough, that if something is seriously wrong, I let an expert diagnose the problem. Love the snow capped mtn. photo. I've always dreamed of taking a road trip up 395....someday...maybe even next year! It is certainly wonderful for me to view the mountains around here. Somewhere close is Mount Whitney! When I see a program on educational television about the imprisonment of Japanese Americans in those camps, it makes me wonder about what happened to all the assets accumulated by them over the years. Were those assets returned to them after the war? If not, where did they go? Imprisoning these people during World War II is, it seems to me, is a clear example of gross racial prejudice. Were Italians and Germans living in the USA imprisoned? NO! Because they are the same race as most Americans. George, you said that you enjoy learning history. You probably would like to learn that Germans and Italians were interred also. Not the same as persons of Japanese ancestry. You flunked history of WWII internment in the US. Way to go George! So happy to see you out adventuring again. Lil iPhone is taking spectacular pics! Safe journey & fair winds. I'm happy to be adventuring again! That last picture looked as if Bob Ross painted it. Thank you! I love to work with my pics to make them appear artistic! I didn't see the link to night camp on this post. From the picture, the camp appears to be high in elevation. if so, little transito must have made it this time. The reason you did not see the Nite Camp link on this post is because I have not published it yet. I will publish the link later. When Little Tránsito had a hard time making it up the grade of Whitney Portal, it was because the grade was MUCH steeper. 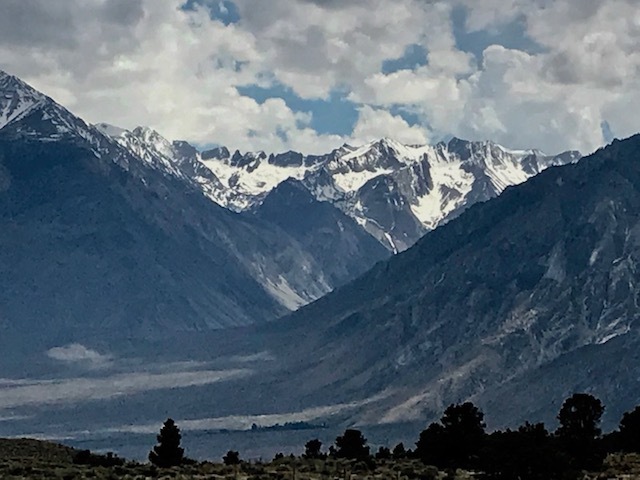 After all, Whitney Portal rises up to the base of the tallest mountain in the the USA! Under the Alien and Sedition Acts. "To a lesser extent, some ethnic German US citizens were classified as suspect after due process and also detained. Similarly, a small portion of ... Italian Americans were interned in relation to their total population in US." Loving all the pictures, George. Sure looks like beautiful country where you are now. Little iPhone and I are enjoying taking pics on this trip! We have passed thru some gorgeous pine forests. But later in life one realizes that it was. Japanese Americans were incarcerated based on local population concentrations and regional politics. More than 110,000 Japanese Americans in the mainland U.S., who mostly lived on the West Coast, were forced into interior camps. However, in Hawaii, where 150,000-plus Japanese Americans composed over one-third of the population, only 1,200 to 1,800 were also interned. 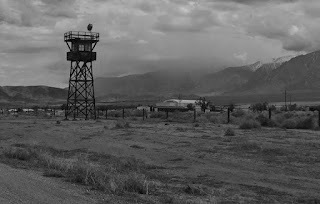 The internment is considered to have resulted more from racism than from any security risk posed by Japanese Americans. Those who were as little as 1/16 Japanese and orphaned infants with "one drop of Japanese blood" were placed in internment camps. In addition to the forced removal of Japanese Americans for purposes of confinement in War Relocation Authority (WRA) camps, the Justice Department oversaw the internment of more than thirty-one thousand civilians during the Second World War. This total included approximately 11,500 people of German ancestry and three thousand people of Italian ancestry, many of whom were United States citizens. These detainees were housed in Justice Department and army camps scattered across the country, from Crystal City, Texas, to Ft. Lincoln, North Dakota, to Sand Island, Hawai'i. The Federal Bureau of Investigation (FBI), the Immigration and Naturalization Service (INS), and a newly created Special Defense Unit (SDU)—at that time all under the Justice Department's supervision—played crucial roles in the wartime confinement of ethnic Germans and Italians. Mister Ed, clearly, Japanese Americans (US citizens) were imprisoned in droves taking away from them all the hard earned assets they had accumulated over time. Notwithstanding that the event, young men in those prison camps as US citizens signed up to fight for this country during World War II, and the US armed forces had no problem inducting them into the armed forces. So why were their families arrested and imprisoned under the Alien and Sedition Acts? Clearly, the reason was prejudice and discrimination of heir race. The quote I gave above from an online history reference also indicates that both German American US citizens and Italian American US citizens were imprisoned under the same Acts. But their arrests were only a handful of people compared to their German American and Italian American populations, respectively. It was not until the recent past that our US President in front of a television camera apologized to the multitude of Japanese American citizens for their mistreatment during that time. However, I still would like to know if their assets were restored to them after the war. 127,000 Japanese Americans were living in the continental US at the time of the Pearl Harbor attack on December 7, 1941. By the time of World War II, the US in 1940 had more than 1.2 million persons living in the US who had been born in Germany. In 1942 there were 695,000 Italian immigrants living in the US. Thanks for your suggestion about occasionally staying in RV parks. I will consider that.